Perfect for processing small, complex parts the INTEGREX i-100 BARTAC-ST Multi-Tasking solution employs a large 4.4" spindle bore to bring high levels of productivity to the machining of bar material up to 4" in diameter. 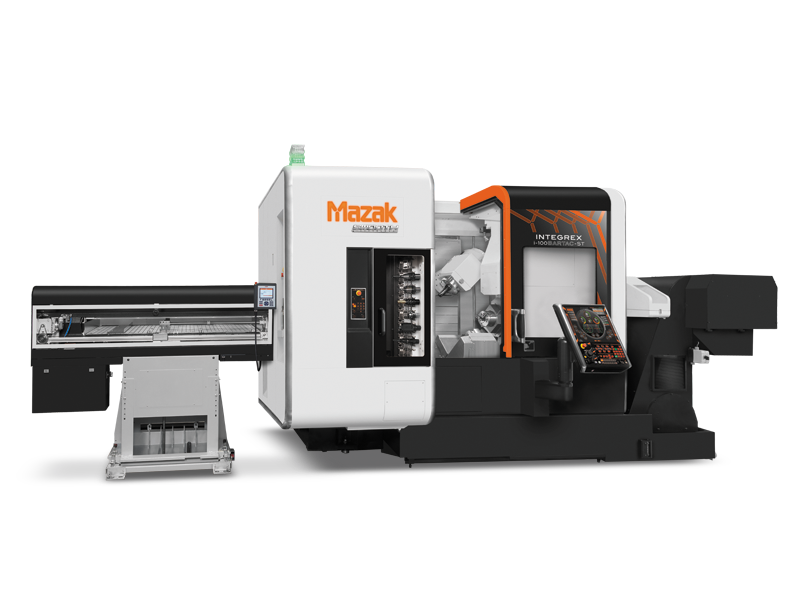 Also adding to the machine’s advanced capabilities are its two turning spindles, milling spindle and lower turret that allow for full 5-axis machining and DONE IN ONE® operations. Therefore, it effectively handles all processes from raw material input through final machining to provide dramatic reductions in lead times and improved workpiece accuracy via the elimination of multiple setups. The INTEGREX i-100 BARTAC-ST’s Intelligent Bar Loader System automatically feeds out the material the required distance from the chuck and minimizes the bar remnant. Furthermore, an optional chuck pressure management system automatically changes by part program for a wide variety of workpieces. It maintains not only the set chuck pressure per workpiece, but also the same pressure when changing material. Designed for convenient system installation, the INTEGREX i-100 BARTAC-ST requires minimal floor space with its small 127" x 98" footprint. Furthermore, for those manufacturers seeking lights-out operations, the machine pairs with an optional integrated work unloader and conveyor that cost effectively handles completed work pieces from the second spindle.